I am so thrilled that many of you purchased your first set of Unit Blocks over the holidays for your little ones. They are certainly an investment, so I want to make sure that your children are actually using them!! 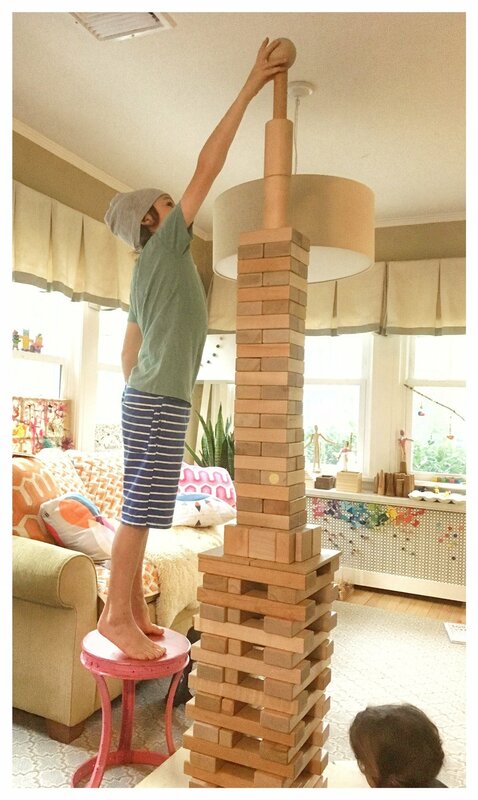 Here is a simple guide to encouraging block play at home or in your classroom. Three simple steps. If you decide to follow them, let me know what works and what does not. Walk out of the room where your blocks live and then walk back in. What is the first thing you feel when you walk into the room? Is there a designated space for block play? How is that space defined? Is the flooring sturdy and even or is it a shag carpet? My first bit of advice is to move some things around to make a designated area for building. There are two reasons for this. One, it shows your child that you value block play. 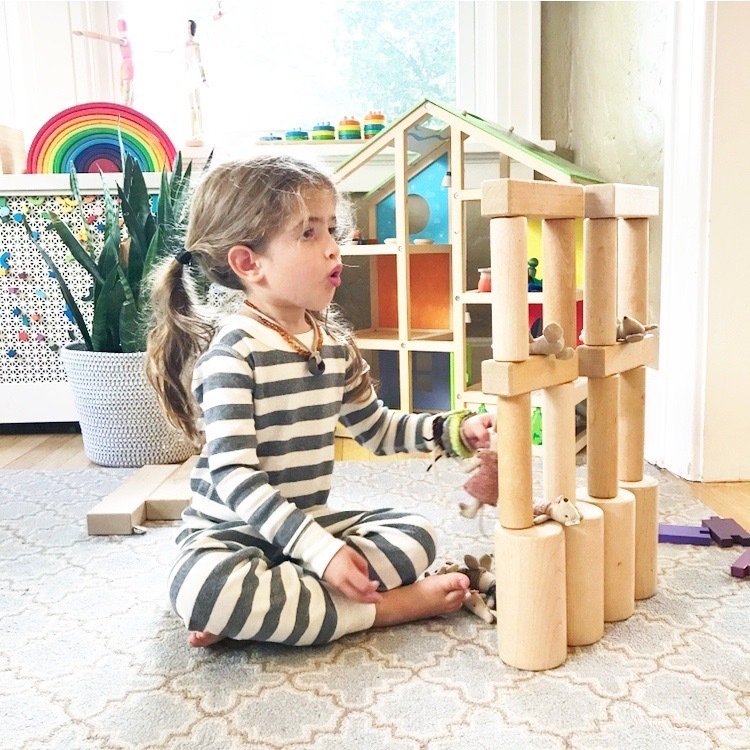 By creating a physical space designed for building, you are helping your child to focus on creating without distraction from his or her thoughts. Think of it like this.. Do you have a designated space where you work? Maybe a desk or a table that holds your computer, important documents, and some reference books? It's easier than just plopping down in the middle of a chaotic, messy room and pulling out your computer, right? Same thing with building and playing. This space does not have to be spacious, just make sure it's big enough for your child to move around and build without getting in her own way. If there are little siblings in the picture, it might help to put this space in an area that is protected from unsteady toddlers or speed crawlers. Maybe you could put a small block shelf in your child's bedroom or perhaps in an area of the house that his little sibling cannot access. (My sister put her block area in an enclosed pen to keep the little ones out and the builders building! Genius.). How do you store your blocks? Are they all dumped into a bin, stuffed behind the trucks and puzzles? You are not alone. Pull them out and sort them by shape. Your child can help you or you can grab a coffee and go it alone while listening to an awesome podcast. I'd go the podcast route, but that's me. Once you have them sorted by shape, decide on a shelving system. My father-in-law built us a custom shelf to house our blocks, but then again, I am the crazy block-lady. You can use a shelf designed for blocks like this one, but these shelves are super pricey and any shelf system that you already have will do. Better yet, check out your local facebook SWAP sites. Get an IKEA hand me down. However you decide to obtain a shelf, just get one. Trust me, it makes all the difference in the world in how your child will use the blocks. When you have your shelf in place, lay out the blocks according to shape and size. You can organize them in a manner that makes sense for you and your child. I try to make sure the larger, heavier blocks are on the bottom, but I'm not sure it really matters. The most important thing is that each shape is visually represented and can be easily accessed by the child. Alright! The hard part is over and all the really great learning and engagement is about to happen. Invite your child into the space that you have created. Show her how you've arranged the materials. Ask her what she might build? Will it be a house for stuffed animals or a parking garage for her race cars? Will she build flat or will her building be tall? With reluctant builders, I might 'pre-build.' That means I might lay out a very simple structure and ask the child how he can add to it. Then follow his lead. He adds a rectangle, you do the same. Try to mirror their block building behavior. Once they get going, you can slowly step back and let them go. Remain interested, but do your own thing. You want to encourage independent play. When I notice my children haven't been building a lot, I do one thing and it works EVERY TIME. I sit in our block area. I just sit there quietly and read on my phone or read a book to them. They usually want to go wherever I am. If I am in our block area, that's where they will be. If those blocks are organized and displayed in an inviting fashion, they can't resist them. And that, my friends, that's where the magic happens. Here is some language you might hear me using to encourage block play. Which shapes will you use first? How can you use these squares to make a long, flat line? How can you use them to make a tall, standing up line? Which blocks would make a sturdy base for your buiding? How can you make a house for your lovey? Will it be tall or will it be down low? Will it have a roof or a door or will it be open? Can you make a pattern using the blocks? Which block do you like? What do you like about it? How can you use it in a building? Snap photos of your child's block building on your phone. Print them out and bind them together with a binder ring and a hole puncher. Hang the photos around the block area to inspire your child. Add a small basket of people and a small basket of cars to the block area. See how it changes the play. Encourage your child to make signs for his or her buildings with a basket containing small pencil and papers. Just remind them not to write on the blocks. I could write about the benefits of block play and how to encourage block play for hours and hours. Do you want to pick my brain? I want to know WHAT you all need help with when using blocks in your home or classroom. Leave me all your questions in the comments below and I will answer them. Our block collection is a hodge podge of unit blocks. Some of them are from my childhood, some of them are THIS SET, and some of them are from THIS SET. Happy building, friends! As always, thank you for following along with me. If you are not already, join me on Instagram by clicking here.